These are just a few recent success stories. New projects are being added weekly. If you have any questions about the retrofits below regarding the fixtures used, pricing, payback time, or rebates received please don't hesitate to contact us. Upgraded 35 stores throughout the south to LED, replacing their standard 1,000w (1,160 plug watt) fixtures with our DL-S-150w (150w) for an incredible 88% energy savings, while drastically improving the quality, reliability, and safety of the site lighting. 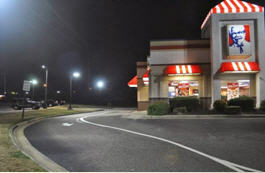 Each store owner made a point to call the franchisee to rave about their new lights! Provided several turn-key solutions for this family owned property management company established in 1888. 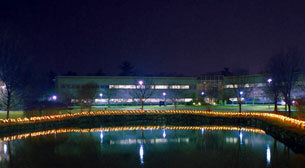 Most recently, we replaced their head quarters site lighting. They went from metal halide site lights using 460 watts to our 40w, for a 92% energy reduction. The project received 43% rebates, and quickly paid itself back. Next up is a large commercial property of theirs. Upgraded roadway lighting and site lighting using 290w with our 60w units (C0820-60S), which significantly improved their overall quality and levels of light. They received 40% rebates and reduced their site lighting costs by 80%. We replaced 64 parking garage fixtures using 197 watts with our 30w, and 250w wall packs with our 30w units for an incredible 85% energy savings. The project was rebated 45% from the purchase and install costs, and paid back in less than a year. We were able to reduce their proposed site lighting from 2,200 watt metal halide flood lights to 230w LED, saving them 90% energy. Additionally, they were able to reduce their proposed 460w metal halide interior lighting, with our own high bay (LLS-HB-100) for an 80% energy savings. The project received 35% energy rebates, the maximum allowable at that time. 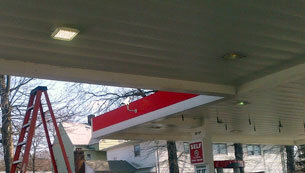 Provided a custom fuel pump canopy retrofit, and custom painted site lights to match existing site aesthetics. Canopy lighting upgrades involved retrofitting (18) 400w metal halide (mh) site lights (using 465 plug watts) to our SANSI C0820-100-FPC, using 100 plug watts. 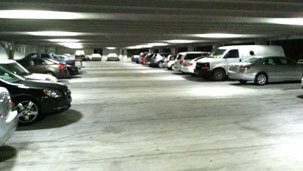 Site Lighting upgrades involved replacing 250w mh (296 plug watts) with our Sansi USA C0820-40S, using 40 plug watts. The custom retrofit took only 15 minutes/unit to install, and was the easiest thing the installer had seen for a canopy light replacement. This upgrade received 40%, on-bill financing, and uses 5 times less energy . Next up, we are upgrading their interior HVAC, freezer cases, and interior lighting. The City’s Department of Transportation purchased our LED through a public bid because we offered the most efficient product with the fastest return on investment. 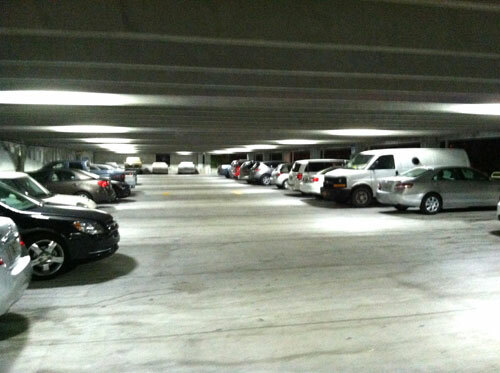 We replaced their 175w metal halide using 209 plug watts with our 50w LED, giving them a 76% energy savings. The LED enhanced their parking garage visibility dramatically and will pay back very quickly, 1.7 years, despite no rebates available in that area. We enhanced entryway lighting for safety and aesthetics while reducing their energy use by 93%, replacing their 400w metal halide using 465 plug watts with our 50w. The Owner thought we would need at least a 100w to come close to his existing lighting. Now he can’t believe how much better and brighter it is using only our 50w. He said “Dam, that looks twice as bright”. We were able to enhance their site lighting to address vandalism issues with their existing 460w metal halide floods and wall packs, with our 100w and 46w wall packunits. We not only saved them 90% on their energy use, but they too received a significant rebate for the project.